More and more and more would seem to be the mantra of most of us in our over-consuming Western world. 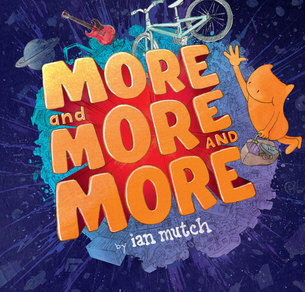 Designer and magazine publisher Ian Mutch from WA address this theme in his debut picture book which is geared towards readers aged 4 and 8 years. Henry Harper is a collector, who, in his quest for treasures – and he has many – one day discovers Kate, a fellow collector. Together, like many consumer couples, they amass an amazing amount of stuff which like most of us wishing to down-size, eventually threatens to overwhelm them. In this book ‘Things were untying, their stuff went flying. Henry cried, ‘EVACUATE’! And like some who decide on a simpler, less junk-filled life, the couple loses their home and all their stuff. But, happily, they discover the best thing of all – that in their quest to collect, they have found each other! Thus, the final illustration shows, in watercolour wash, Henry and Kate in embrace watching the sun set. Appropriately, the fly pages of this book about over-consumption are filled with pen and ink sketches of all kinds of stuff from bikes to umbrellas (and much more!) The opening pages show Henry in outer space on his quest for stuff (‘The more stuff he had, the happier he felt.’) Much of the action of the book, except the last few pages, is shown in space, planet Earth spinning with stuff issuing from it. Thus, most of the pages have dark backgrounds with muted coloured pictures of characters (which don’t look at all human). Some of the lines make use of rhyming end words which doubtless would aid adults reading aloud to small children. The book’s creator no doubt believes that change starts at a very young age! Recommended.